SOEP offers diverse possibilities for regional and spatial analysis. With the anonymized regional information on the residences of SOEP respondents (households and individuals), it is possible to link numerous regional indicators on the levels of the states (Bundesländer), spatial planning regions, districts, and postal codes with the SOEP data on these households. However, specific security provisions must be observed due to the sensitivity of the data under data protection law (see overview). Accordingly, you are not allowed to make statements on, e.g., place of residence or administrative district in your analyses, but the data does provide valuable background information. The highly populous states, e.g., Baden-Wuerrttemberg, Bavaria, and North Rhine-Westphalia, can be used for analysis given the large sample size. In general, the danger exists that for more detailed structural analyses, the case numbers on the specific states are too low to allow for statistically significant conclusions. The data can be evaluated, however, for "pools" of individual smaller federal states (e.g., state types). The variable $BULA (= Bundesland) is contained in the standard data set. 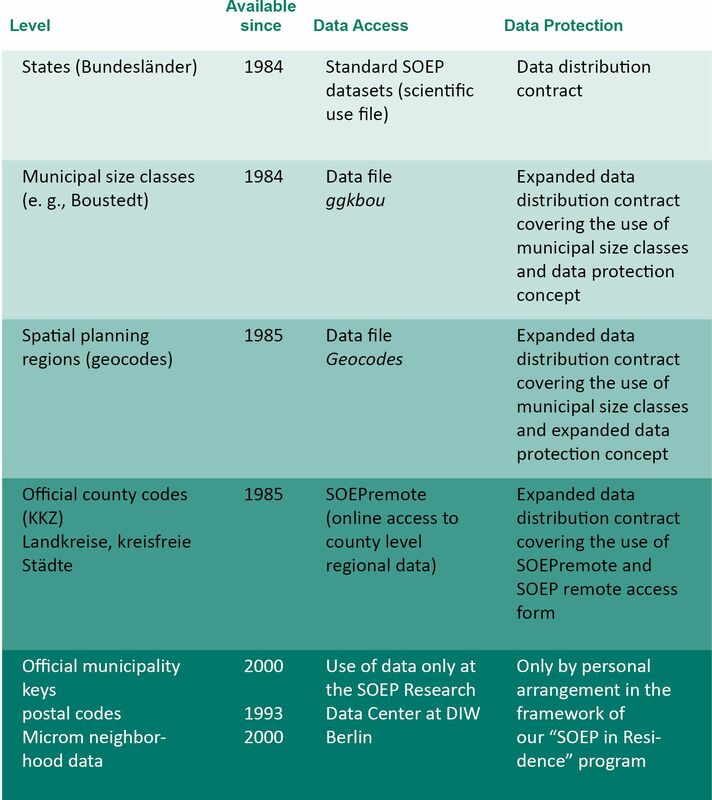 If you need more detailed regional information for your research work, e.g., the municipal size classes provided on the SOEP DVD, you need an expanded data distribution contract, which consists mainly of a data protection concept (guideline | PDF, 18.83 KB ) to be developed by you. To use the spatial planning regions (ROR) you need both an expanded data distribution contract and an expanded data protection concept. After signing your contract, you will receive this data on CD-ROM (at cost). On research stays at DIW Berlin or using our SOEPremote system of remote computer access, you can conduct analyses on the level of small-scale official district codes (KKZ), which are considered highly sensitive data under data protection regulations. The precondition for using SOEPremote is, again, an expanded data distribution contract and an application for the use of SOEPremote | PDF, 70.23 KB , which also constitutes an addendum to your contract. After activation of access, you can transfer your analysis syntax (currently only in STATA format) through the remote access system by e-mail to our server. This processes the task automatically-after verifying data protection requirements-and sends you the results by email in a log file. Postal code data can only be used on site at DIW Berlin in order to prevent misuse. For another overview of our regional data, please also have a look at our flyer | PDF, 0.54 MB . Who will work with the data? This must be signed by the data protection officer of your institution. This data protection concept must be signed by the data protection officer of your institution. An example of such a data protection concept, which of course would have to be adapted to your institution, can be found here | PDF, 18.83 KB . You are welcome to send us a draft of your data protection concept by e-mail.